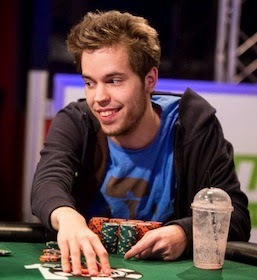 The young German player Dominik Nitsche won another WSOP bracelet last night in Event No. 21, a $1,000 no-limit hold’em event. That makes three for him as he just won the WSOP National Championship a few weeks ago (which counts as a bracelet event), and he’d won his first back in 2012 in another $1,000 NLHE tourney. I was there two years ago to help cover Nitsche’s first bracelet win. That one had a big field of 4,620 take part -- it was one of the last events of the summer. I remember it had originally been scheduled as a four-day event. There were 51 players who came back for Day 3, and Nitsche blitzed through so quickly they were able to end a day early. He picked up a lot of big hands at that final table, I also recall, which helped hasten things at the end. Nitsche bested another big field of 2,043 to win last night. Looking back through the coverage, the heads-up portion of play provided some interesting moments, including some good fortune for Nitsche on more than one occasion. Dave D’Alesandro was Nitsche’s heads-up opponent, and he enjoyed about a 2.5-to-1 chip lead as they began. They’d end up playing about 90 hands, with Nitsche doubling up no less than four times before grabbing the advantage and then eventually knocking D’Alesandro out the first time the latter was all in and at risk. The first of those double-ups was the most fortunate for Nitsche as he’d committed with 10-9-suited versus D’Alesandro’s A-Q and hit a ten on the river to survive. Nitsche’s obviously a talented no-limit hold’em tourney player -- aside from these three WSOP wins, he has tons of other results totaling more than $3.7 million. He also has both an LAPT title and a WPT title, too, so when he eventually gets around to winning an EPT they’ll have to invent a name for the feat (the Quadruple Crown?). And no, to reprise yesterday’s topic, none of the 25K Fantasy teams drafted him. He’s just 23 years old, and in fact wins a third bracelet some three years faster than Phil Ivey did, who had gotten to three faster than anyone previous to Nitsche. The fortunate flips and all-ins last night highlight what is likely a facile observation that variance has been kind to Nitsche in his brief WSOP career thus far. That said, he’s put himself in good positions for good things to happen a whole lot already, and has found a niche of sorts at the WSOP, too.